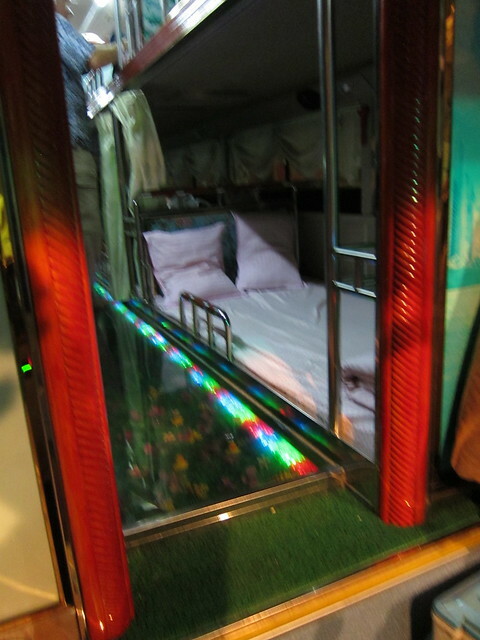 The DOs and DON’Ts of a Lao sleeper bus – snackettes. We had already been traveling for 2 full days to get from Siem Reap, Cambodia to our eventual first stop in Laos. Along the way, we had taken a 10-hour bus ride and gotten stuck at the Cambodia-Laos border crossing when we arrived after it had closed for the day, we had bribed border guards with money to stamp our passports (the corruption! ), we were exhausted and getting tired of moving around… So we were relieved when we learned that the bus that we would be taking on the final overnight push from Pakse, Laos to Vientiane, Laos was a sleeper bus – complete with horizontal beds, pillows, blankets, everything one might want for an uneventful nights sleep! *DO put your shoes into the plastic baggie provided before entering the bus to avoid scratching the glass-topped disco floor that makes up the aisle. *DO greet your seatmate that you will be spooning for the next 10 hours. (There are 2 people to one twin-size bed, unless you buy out the entire bed with two tickets. The giant kilt-wearing Scandinavian man and the 5-foot Lao farmer seemed an odd couple.). *DO sleep in the most mobility-limited position you can find—preferably flat on your back with your hands interlocked over your stomach. But even then, DO bring loads of ibuprofen to soften the blows to your head that you will encounter for the next 10 straight hours. *Even after 10 straight hours of throwing back Lao beer on the bus, please, just DON’T, DON’T use the bathroom. *If you DO use the bathroom, DON’T wear pants that drag the ground, DO bring your own toilet paper (there is none), and DO bring your own trashcan to put it in (there’s not one..and can’t flush your TP here…). DON’T fall into the bathroom walls or accidentally step into the squat toilet when the bus hits the inevitable bump. Upon exiting, DO spray down your feet with the bum-hose next to the toilet. (Somehow, I managed to neglect all of these rules and was not allowed to climb back into bed afterwards.) DO wipe hand sanitizer on your feet and hands afterwards (of course there is nowhere to wash your hands—that would just be silly at this point). *This should be obvious by now, but DON’T get locked inside said-bathroom when the bus assistant comes back to secure things; if it is your sleeping companion that gets locked inside, DON’T just laugh until you cry (like Scott did)– DO help them out, instead. *DO thank your driver for providing you with blaring Cambodian karaoke music and multi-colored disco lights as your wake-up call at 5:00 am when you’ve reached your destination. *Upon exiting the bus, DO let the rooster that was apparently in the luggage compartment underneath the bus THE WHOLE TIME out of the bus. *DO laugh hysterically as your sleep-deprived brain thinks back fondly on all the fun you’ve just had, as you stumble into the nearest hotel and finally, finally fall fast asleep…..
Just tuning into your travels Steph…awesome first post to read! You are amazing and what memories you are making!!! Be safe and have fun! Thanks so much, Summer! And thanks for reading along on our blog. Hope you and Matt had a wonderful Christmas and New Year! Take care! OH MY GOD!!! While I cried all through the post done on 1/3 12 THIS entry was the funniest thing i have EVER read!!! PLEASE PLEASE PLEASE plan to publish this blog as a book – it will be a best seller for sure! Hilarious! I love your blog! Thanks for sharing your adventures with us. This is the funniest thing I have ever read! I can’t believe you managed to do all those things in the bathroom! I’m glad my bathroom adventures amuse you! For me, the real kicker of the whole adventure was just getting off of that awful bus only to find that there was a freakin rooster under the bus the whole time! WOW! :) Say hi to everyone for me!! Your post made us laugh until we cried. Unfortunately we didn’t read this before we booked an overnight bus from Houayxay to Luang Prabang! We are now hoping and praying we get a sitting bus for our overnight journey in a few days!! We’ve got the sleeping bus!!! !